I purchased a HICTOP 3DP-12 printer from Amazon on Cyber Monday 2016. Assembly went well and initial prints were very impressive. After about 2 weeks of occasional use I started getting these strange ridges in the print. The ridges are mostly in the X but are still in the Y as well. Here are images of the issue. At first I figured that the lead screws for the Z must be bent, though if you look carefully you will see that the artifact does not repeat at the same interval. The interval seems to be defined by the length of filament being extruded. The base and the middle of the body have the ridges closer together and at the feet and head they spread further apart. 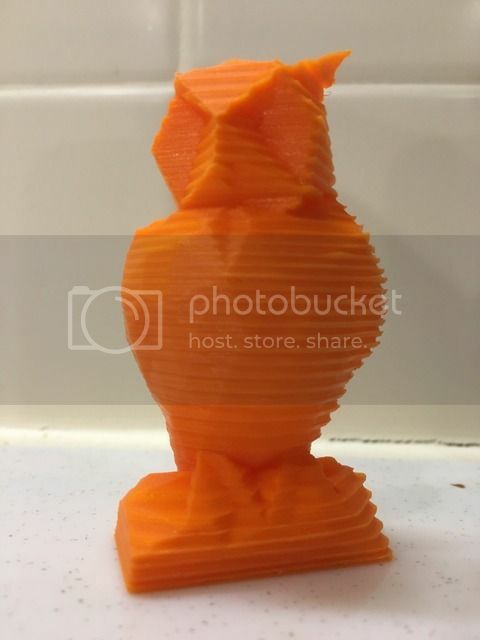 The slicing and GCode for the owl was done with Cura, .06mm layer thickness. I pulled my direct drive extruder apart and cleaned the grooves in the gear, made sure the set screws were tight (they were), then put it back together. Here are some 10mm cubes that I printed after the cleaning. The cube on the right was .6mm layer thickness, the one on the left was .1mm or .15mm Both have issues though the repeat is VERRY different. The brim on the left cube has a really weird looking pattern. I don't know what that is all about, is my head a little close to the bed or is it showing the root cause of my issue with differing amounts of material being extruded? 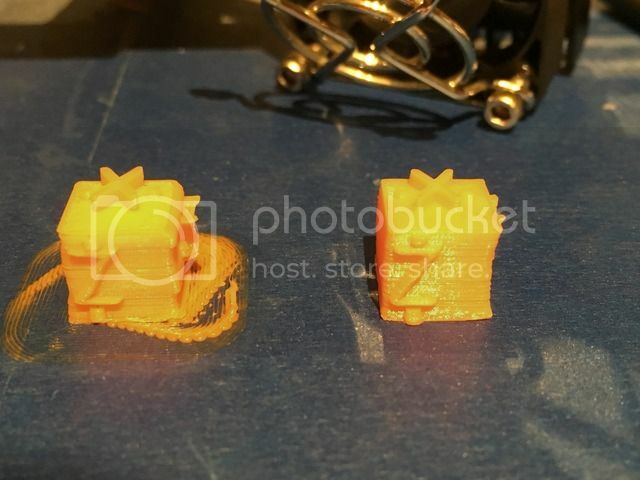 The brim for the cube on the right seemed to print okay. 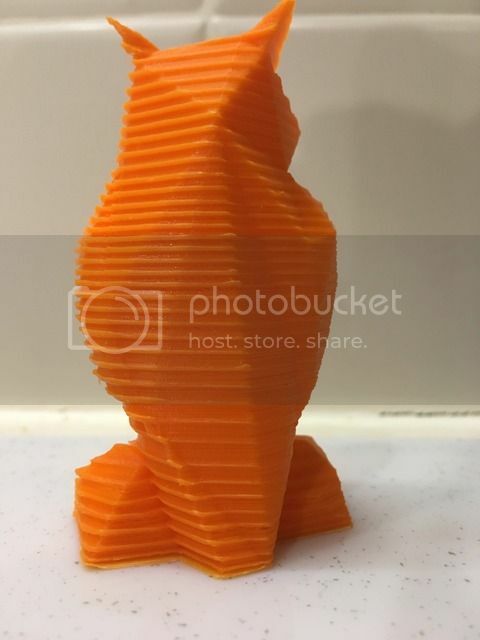 Here is an example of a Pokemon Rook that my son printed a day or two after Christmas. .06mm layer height and no issues. All prints shown are PLA printed with a head temp of 210, bed temp of 50. 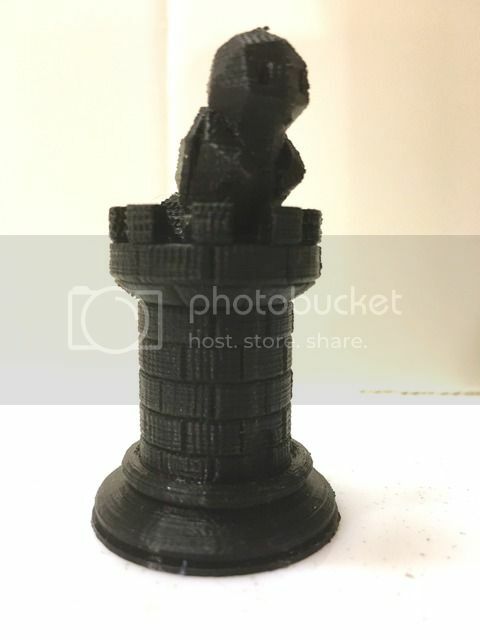 I have tried using Cura and Repetier, both had similar results. The prints did seem to go haywire after I tried testing some NinjaFlex and Taulman PETT T-Glase, not sure if that has anything to do with it. Thanks for any assistance you can provide. It would be greatly appreciated as I am clearly a noob. It should be self explanatory but for clarity I'll add that the ridges in the owl are not at subsequent layer intervals. There are many layers printed in between the ridges. I suspect you have the z-steps set wrong perhaps from the firmware? I know on some of the Ultimaker heated bed upgrades, which replaced the z-motor, we got these "stretched" prints in some instances. Flashing to the latest version of the firmware (with the correct z-steps for the different stepper motor type) fixed it. I've only done a test cube so far, but I'm printing the anti-wobble things again as to hopefully get a better set (without the ridges). I'll let you know how it turns out.